Isaac Newton's rotating bucket argument (also known as Newton's bucket) was designed to demonstrate that true rotational motion cannot be defined as the relative rotation of the body with respect to the immediately surrounding bodies. It is one of five arguments from the "properties, causes, and effects" of "true motion and rest" that support his contention that, in general, true motion and rest cannot be defined as special instances of motion or rest relative to other bodies, but instead can be defined only by reference to absolute space. Alternatively, these experiments provide an operational definition of what is meant by "absolute rotation", and do not pretend to address the question of "rotation relative to what?" General relativity dispenses with absolute space and with physics whose cause is external to the system, with the concept of geodesics of spacetime. These arguments, and a discussion of the distinctions between absolute and relative time, space, place and motion, appear in a General Scholium at the very beginning of Newton's work, The Mathematical Principles of Natural Philosophy (1687), which established the foundations of classical mechanics and introduced his law of universal gravitation, which yielded the first quantitatively adequate dynamical explanation of planetary motion. Despite their embrace of the principle of rectilinear inertia and the recognition of the kinematical relativity of apparent motion (which underlies whether the Ptolemaic or the Copernican system is correct), natural philosophers of the seventeenth century continued to consider true motion and rest as physically separate descriptors of an individual body. The dominant view Newton opposed was devised by René Descartes, and was supported (in part) by Gottfried Leibniz. It held that empty space is a metaphysical impossibility because space is nothing other than the extension of matter, or, in other words, that when one speaks of the space between things one is actually making reference to the relationship that exists between those things and not to some entity that stands between them. Concordant with the above understanding, any assertion about the motion of a body boils down to a description over time in which the body under consideration is at t1 found in the vicinity of one group of "landmark" bodies and at some t2 is found in the vicinity of some other "landmark" body or bodies. Detection of rotation: red flags pop out on flexible arms when either object actually rotates. A: Central object rotates. B: Outer ring rotates, but in opposite direction. C: Both rotate, but in opposite directions. D: Both are locked together and rotate in the same direction. Descartes recognized that there would be a real difference, however, between a situation in which a body with movable parts and originally at rest with respect to a surrounding ring was itself accelerated to a certain angular velocity with respect to the ring, and another situation in which the surrounding ring were given a contrary acceleration with respect to the central object. With sole regard to the central object and the surrounding ring, the motions would be indistinguishable from each other assuming that both the central object and the surrounding ring were absolutely rigid objects. However, if neither the central object nor the surrounding ring were absolutely rigid then the parts of one or both of them would tend to fly out from the axis of rotation. For contingent reasons having to do with the Inquisition, Descartes spoke of motion as both absolute and relative. [not in citation given] However, his real position was that motion is absolute. By the late 19th century, the contention that all motion is relative was re-introduced, notably by Ernst Mach (1883). Although the relative motion at this stage is the greatest, the surface of the water remains flat, indicating that the parts of the water have no tendency to recede from the axis of relative motion, despite proximity to the pail. Eventually, as the cord continues to unwind, the surface of the water assumes a concave shape as it acquires the motion of the bucket spinning relative to the experimenter. This concave shape shows that the water is rotating, despite the fact that the water is at rest relative to the pail. In other words, it is not the relative motion of the pail and water that causes concavity of the water, contrary to the idea that motions can only be relative, and that there is no absolute motion. (This situation would correspond to diagram D.) Possibly the concavity of the water shows rotation relative to something else: say absolute space? Newton says: "One can find out and measure the true and absolute circular motion of the water". If a vessel, hung by a long cord, is so often turned about that the cord is strongly twisted, then filled with water, and held at rest together with the water; after, by the sudden action of another force, it is whirled about in the contrary way, and while the cord is untwisting itself, the vessel continues for some time this motion; the surface of the water will at first be plain, as before the vessel began to move; but the vessel by gradually communicating its motion to the water, will make it begin sensibly to revolve, and recede by little and little, and ascend to the sides of the vessel, forming itself into a concave figure...This ascent of the water shows its endeavour to recede from the axis of its motion; and the true and absolute circular motion of the water, which is here directly contrary to the relative, discovers itself, and may be measured by this endeavour. ... And therefore, this endeavour does not depend upon any translation of the water in respect to ambient bodies, nor can true circular motion be defined by such translation. ...; but relative motions...are altogether destitute of any real effect. ...It is indeed a matter of great difficulty to discover, and effectually to distinguish, the true motions of particular bodies from the apparent; because the parts of that immovable space in which these motions are performed, do by no means come under the observations of our senses. Newton's experiment with the rotating vessel of water simply informs us that the relative rotation of the water with respect to the sides of the vessel produces no noticeable centrifugal forces, but that such forces are produced by its relative rotations with respect to the mass of the earth and other celestial bodies. The degree in which Mach's hypothesis is integrated in general relativity is discussed in the article Mach's principle; it is generally held that general relativity is not entirely Machian. A supplementary thought experiment with the same objective of determining the occurrence of absolute rotation also was proposed by Newton: the example of observing two identical spheres in rotation about their center of gravity and tied together by a string. Occurrence of tension in the string is indicative of absolute rotation; see Rotating spheres. The interface of two immiscible liquids rotating around a vertical axis is an upward-opening circular paraboloid. 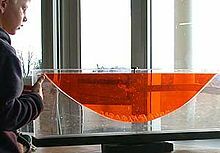 The historic interest of the rotating bucket experiment is its usefulness in suggesting one can detect absolute rotation by observation of the shape of the surface of the water. However, one might question just how rotation brings about this change. Below are two approaches to understanding the concavity of the surface of rotating water in a bucket. Force diagram for an element of water surface in co-rotating frame. Top: Radial section and selected point on water surface; the water, the co-rotating frame, and the radial section share a constant angular rate of rotation given by the vector Ω. Bottom: Force diagram at selected point on surface. The slope of the surface adjusts to make all three forces sum to zero. The surface of a fluid of uniform density..., if at rest, is everywhere perpendicular to the lines of force; for if this were not so, the force at a point on the surface could be resolved into two components, one perpendicular and the other tangent to the surface. But from the nature of a fluid, the tangential force would set up a motion of the fluid, which is contrary to the statement that the fluid is at rest. where h(0) is the height of the water at r = 0. In words, the surface of the water is parabolic in its dependence upon the radius. The meaning of the potential energy is that movement of a test body from a larger radius to a smaller radius involves doing work against the centrifugal force. The potential energy is useful, for example, in understanding the concavity of the water surface in a rotating bucket. Notice that at equilibrium the surface adopts a shape such that an element of volume at any location on its surface has the same potential energy as at any other. That being so, no element of water on the surface has any incentive to move position, because all positions are equivalent in energy. That is, equilibrium is attained. On the other hand, were surface regions with lower energy available, the water occupying surface locations of higher potential energy would move to occupy these positions of lower energy, inasmuch as there is no barrier to lateral movement in an ideal liquid. We might imagine deliberately upsetting this equilibrium situation by somehow momentarily altering the surface shape of the water to make it different from an equal-energy surface. This change in shape would not be stable, and the water would not stay in our artificially contrived shape, but engage in a transient exploration of many shapes until non-ideal frictional forces introduced by sloshing, either against the sides of the bucket or by the non-ideal nature of the liquid, killed the oscillations and the water settled down to the equilibrium shape. To see the principle of an equal-energy surface at work, imagine gradually increasing the rate of rotation of the bucket from zero. The water surface is flat at first, and clearly a surface of equal potential energy because all points on the surface are at the same height in the gravitational field acting upon the water. At some small angular rate of rotation, however, an element of surface water can achieve lower potential energy by moving outward under the influence of the centrifugal force. Because water is incompressible and must remain within the confines of the bucket, this outward movement increases the depth of water at the larger radius, increasing the height of the surface at larger radius, and lowering it at smaller radius. The surface of the water becomes slightly concave, with the consequence that the potential energy of the water at the greater radius is increased by the work done against gravity to achieve the greater height. As the height of water increases, movement toward the periphery becomes no longer advantageous, because the reduction in potential energy from working with the centrifugal force is balanced against the increase in energy working against gravity. Thus, at a given angular rate of rotation, a concave surface represents the stable situation, and the more rapid the rotation, the more concave this surface. If rotation is arrested, the energy stored in fashioning the concave surface must be dissipated, for example through friction, before an equilibrium flat surface is restored. where h(0) is the height at r = 0 (the axis). See Figures 1 and 2. The principle of operation of the centrifuge also can be simply understood in terms of this expression for the potential energy, which shows that it is favorable energetically when the volume far from the axis of rotation is occupied by the heavier substance. ^ Robert Disalle (I. Bernard Cohen & George E. Smith, editors) (2002). The Cambridge Companion to Newton. Cambridge University Press. p. 43. ISBN 0-521-65696-6. ^ See the Principia on line at Andrew Motte translation, pp. 77–82. ^ René Descartes, John Cottingham translator (1988). Descartes: Selected Philosophical Writings. Cambridge University Press. p. 191. ISBN 0-521-35812-4. ^ Alexandre Koyre (1957). From the Closed World to the Infinite Universe. Forgotten Books. p. 75. ISBN 1-60620-143-3. ^ René Descartes (1664). Principia philosophiae. Part ii, §25, p. 105. ^ Daniel Garber (1992). Descartes' Metaphysical Physics. University of Chicago Press. p. 170. ISBN 0-226-28219-8. ^ Robert Disalle (2006). Understanding Space-time: The philosophical development of physics from Newton to Einstein. Cambridge University Press. p. 19. ISBN 0-521-85790-2. ^ Mach, E. (1960 ), The Science of Mechanics, LaSalle, IL: Open Court Publishing, p. 284. ^ Ignazio Ciufolini, John Archibald Wheeler (1995). Gravitation and Inertia. Princeton University Press. pp. 386–387. ISBN 0-691-03323-4. ^ For a discussion of Newton's original argument, see Max Born & Günther Leibfried. Einstein's Theory of Relativity. New York: Courier Dover Publications. pp. 78–79. ISBN 0-486-60769-0. ^ Robert Disalle. "Newton's philosophical analysis of space and time". In I. Bernard Cohen, George Edwin Smith. op. cit.. p. 45. ISBN 0-521-65696-6. ^ L. Bouquiaux (Marcelo Dascal, editor) (2008). Leibniz. Springer. p. 104. ISBN 1-4020-8667-9. ^ Robert DiSalle (Summer 2002). "Space and Time: Inertial Frames". In Edward N. Zalta. The Stanford Encyclopedia of Philosophy. ^ Jens M. Knudsen, Poul G. Hjorth (2000). Elements of Newtonian Mechanics (3rd ed.). Springer. p. 143. ISBN 3-540-67652-X. ^ Lawrence S. Lerner (1997). Physics for Scientists and Engineers. Jones & Bartlett. p. 404. ISBN 0-86720-479-6. ^ William Arnold Anthony & Cyrus Fogg Brackett (1884). Elementary Text-book of Physics. Wiley. p. 127. ^ Robert Daniel Carmichael (1920). The Theory of Relativity. John Wiley & Sons. p. 78. ^ Hans J. Weber & George B. Arfken (2003). Essential mathematical methods for physicists. Academic Press. p. 79. ISBN 0-12-059877-9. Brian Greene (2004). "Chapter 2, The Universe and the Bucket". The Fabric of the Cosmos: Space, Time, and the Texture of Reality. A A Knopf. ISBN 0-375-41288-3. R. B. Partridge (1995). 3 K: The Cosmic Microwave Background Radiation. Cambridge University Press. pp. 279–280. ISBN 0-521-35254-1. D. Lynden-Bell (1996). Relativistic Astrophysics (Igorʹ Dmitrievich Novikov, Bernard Jean Trefor Jones, Draza Marković (Editors) ed.). p. 167. ISBN 0-521-62113-5. Ralph A. Alpher and Robert Herman (1975). Big bang cosmology and the cosmic black-body radiation (in Proc. Am. Phil. Soc. vol. 119, no. 5 (1975) ed.). pp. 325–348. Newton's Views on Space, Time, and Motion from Stanford Encyclopedia of Philosophy, article by Robert Rynasiewicz. At the end of this article, loss of fine distinctions in the translations as compared to the original Latin text is discussed. Life and Philosophy of Leibniz see section on Space, Time and Indiscernibles for Leibniz arguing against the idea of space acting as a causal agent. This page was last edited on 13 April 2018, at 07:30 (UTC).